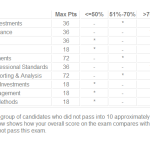 Yesterday I took the CFA Level II exam for the second time, and I think I have a good chance of passing this time. As expected, it was extremely challenging; out of the 120 questions, I would estimate that I outright guessed on about 12-15. However, on the remaining questions I felt good about my answers; I did the calculations and got one of the answer choices nearly every time. My goal was to get 70% of the questions correct, which would be 84 of out 120. As a rough calculation, if I got 75% correct on the questions I knew (0.75 * 108 questions = 81 correct) and got 33% correct on the questions I guessed (0.33 * 12 = 4 correct), then I’d estimate I got 85 out 120 questions correct (71%), which would result in a pass! While much of the material that I had studied directly appeared on the exam, there were also some topics that I had studied for 10-20 hours that did not appear on the exam. That’s why Level II is so difficult: there are 60 readings to draw material from, but only 24 item sets on the exam. However, you really have to know all 60 readings. For example, on Derivatives, you know there will be 1-3 item sets on the exam (CFA Level II topic weights can be found here). However, the item sets can draw from any of these topics: futures, forwards, options, swaps, interest rates. Every one of these topics has individual calculations and formulas, and you really have to memorize them all because you don’t know which one will show up on the exam. I’m looking forward to seeing my results in about 2 months.